These machines are built on one of the styles of three types of frames that Sailor Jerry cast. The original shader frame was modified by Paul Rogers who straightened the upright to shorten the geometry of the original Jerry frame. I call the shader the “Straight-Arm” because of Paul’s modification. Paul took the same frame and bent it back to create a faster running liner, which I used for inspiration for the “Bent Back Liner.” Another modification that Paul did was to use his signature collet tube vice. The tube vice I used is the original style that Jerry intended. These machines have a front loader vice with a pinch bolt between the tube hole and the front coil. As far as I know Jerry was the first one to have done a tube vice in this fashion. I have seen a few of them that had a sawed front loader vice (which I have reproduced on the Straight-arm). I speculate that Jerry milled these. Mike Malone and Ed Hardy owned two of the original shader machines that Paul built with the front loader vice. Mike and Ed used them for the majority of their tattooing careers from the mid 1970’s onward. These frames are not an exact copy of Paul’s modifications because Paul did each modification by hand, therefore each machine was unique. The frames for the Straight-Arm Shader and the Bent Back Liner are milled on a CNC machine, which I feel has the closest tolerances of any method of frame manufacturing design. Both frames are milled from a solid block of billet 1018 steel for its strength and magnetic conductivity. Like all of my machines they are made of the highest quality parts. The coils for these machines are hand wrapped with great precision by Gordon “Wrath” McCloud. Similar to the Streamliner, the Straight-Arm & the Bent Back Liner will be a limited run of less than 100. A share of the proceeds will be distributed each to Jerry’s daughter and Paul Rogers Inc. via Paul’s Granddaughter. 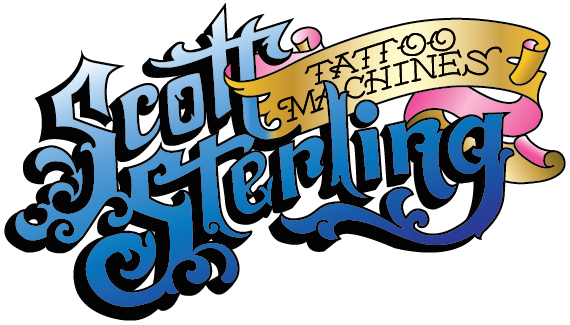 In my 35 years of building tattoo machines I feel without a doubt that these are the best performing machines I have built in my career.